AWS have recently introduced a new service called Lightsail which I think is really great to use as a replacement for my home-server. I use my home server(s) extensively for my work as a big data developer. My home setup consists of Ubuntu with LAMP stack on it. Which is perfect to host some presentations, websites, share files and the most important is my stepping stone when I need to access free Internet bypassing corporate firewalls. My home-server is running day and night every day consuming some power and requires regular updates or maintenance from time to time. In contrast AWS Lightsail is living in a AWS cloud and is always online for as little as 3.50 USD a month. 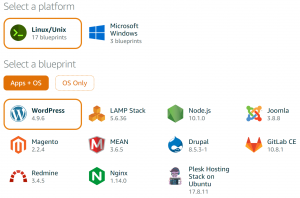 The service is available as Linux or Windows and ready to be configured as application where you can chose from WordPress, LAMP stack, Node.js, GitLab and few more. The host operating system can be selected from very small 512MB RAM, 1GB CPU, 20GB disk and 1T data transfer up to 8CPUs, 32GB RAM and 640GB disk space. And then the best thing is a price starting at 3,50 USD a month. Which is bargain compared to running costs of my homeserver considering initial hardware cost, power used, time spend on updates and maintenance and also very important I’m not depending anymore of my home internet connection which sometimes goes down or my semi-static DNS address which can change from time to time. Given that I have two desktop computers running 24/7 whole year consuming on average 100 Watts then only electricity costs are around 440 EUR a year. The cheapest Lightsail option cost 3,50 * 12 = 42 EUR per year. Okay it’s not fair to compare home desktop with 8 TB storage and 32GB RAM to a Lightsail instance comparable to Raspberry Pi. For the record Raspberry Pi running whole year will cost only 5 EUR. But if I only turn the desktops ON when needed which is (at the moment mostly working from office) about 3 hours a day [(3*356*(100/1000))*0.24 = 25,6 EUR].